EnMS-Doc Associates together with its Singapore partner Antris Management Solutions hosted a 3-day EnMS Workshop 23-25 April in Singapore. The workshop focussing on energy management was very timely for the reason in the same week Singapore's New Energy Conservation Act (ECA) came in force on 22 April, just the day before the workshop. Having a guest presenter, Mr. Winston Tan, Assistant Manager, Energy Efficiency & Conservation Department, National Environment Agency (NEA), the overview of the new Energy Conservation Act was presented. Mr. Tan stressed the point that the prime objective of the Energy Conservation Act has been introduced to assist industries in improving the energy efficiency of their operation and strengthen their business position globally, and elaborated NEA’s position to promote ISO 50001 standard that would play an important role in strengthening the implementation of the act. Workshop participants were able to have clear understanding of the act, and we were proud to report to NEA that our workshop had provided all the key practical energy management elements that they can now smoothly adapt the requirements of the act with the ISO 50001 class EnMS operational aspects. All participants agreed that the workshop built confidence level to lead their organisation business unit to ISO 50001 Class EnMS operation not only from the knowledge gained but also by the actual experience gained through the practical approach of the workshop. Throughout the workshop, the sessions were under the framework of “wiki50001.com” compliments of the solution software provider TEAM UK. One of the highlights was in the audit exercise when participants experienced wiki50001 to be an intelligent friend of auditees, compiling all the elements and documentation compatible to ISO 50001 guideline ensuring high level assessment result from the audit activities. For the workshop, EnMS-Doc's ISO 50001 Class EnMS 12 management documents as well as the EnMS audit guideline and scorecard system were given, and the contents were explained to participants. Most of participants found by possessing the ready made document set was very useful and the core part of the documentation framework in EnMS operation for their organisation was well under control for ISO 50001 compatibility, thus saving enormous time. Additionally they found out with the given documents, all the existing EnMS documents and records used by organisation had become ISO 50001 class which was rated to be the powerful aspect of the EnMS-Doc's documents. "Energy" is a set of creatures running around your buildings and factories without interruption. If you cannot see “Energy” movement, you cannot see where "Muda" exist nor how to Improve. “Putting Lean Energy off” means allowing "Energy loss" to continue. In other words, compromising to "profit loss"
Capable person says "difficult but possible", for action. Average person says "possible but difficult", for status quo. " "Lean Energy" is to be practiced by everyone. It is trivially common that everyone is destined to be "busy". Superior company manages to set up system to act positively while making people "busy"
"How much can you save?" "What is the payback period?" No one can provide assured answers!! Because "Lean energy" is to be implemented by people. issues", while achieving cost reduction. 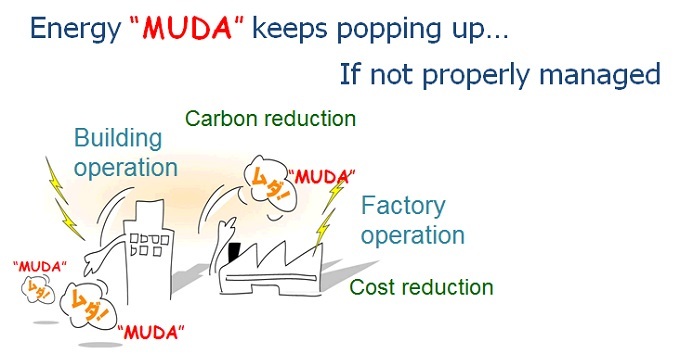 Eliminating Energy "MUDA" through "Lean Energy Management" requires effort by all people. Corporate energy cost reduction cannot be achieved without spending people's "Energy". 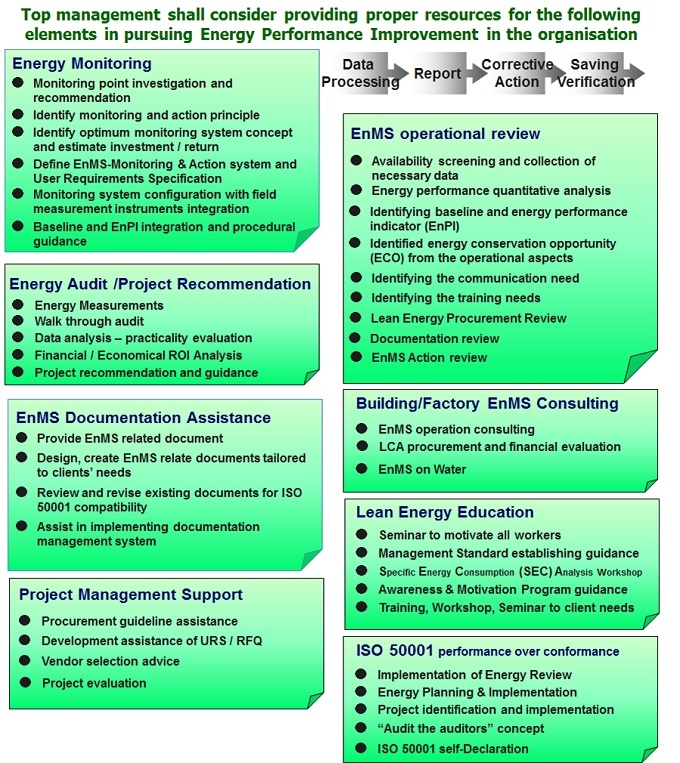 The feature of ISO 50001 is the practical guideline to implement effective EnMS operation participated by entire workforce engaged in PDCA: "P" for Plan (Develop plan based on energy review exercise); "D" for Do implement the plan; "C" for Check as evaluating the progress of implementation and degree of achievement to the targets; and "A" for Act to what is necessary for organisation whether to maintain the level of improvement or further pursuing improvement. Therefore, the requirements are positive thinking and practical. Any top management will recognise that by performing to the ISO 50001 requirement, it ensures to take superior position in developing sustainability business. In order to take advantage of the requirement for the betterment of business operation and to maintain the established framework, one must at least establish a foundation of documentation. Once going through each item of requirements, there exist responding documents required to support complying with each item. We have created an analysis table "Documents responding to ISO 50001 requirements" demonstrating applicable documents for requirement item. Once you go through the table you will immediately come to realise that once you have established 12 key management documents as shown below. This is the reasoning behind EnMS-Doc developed the M333 Set Menu #101"all 12 key management documents in a set" as our feature offering. The greatest thing about ISO 50001 is once the compatible management documents are in line, they will convert your existing documents related to EnMS operation such as procedural documents, daily journals and data into ISO 50001 documents. Introduction to the "wiki50001 Asia-Pacif Version"
Availability of "ISO 50001 Certified Comapany and Site List"
Competent EnMS operation with solid documentation leads the organisation to ISO 50001 conformity and voluntarily declare its compliance. The organisation then can decide if the certification is strategically beneficial for their business. Expressing the utmost respect to the ISO organization, PC242 and associated members involved in launching the standard as a result of their invaluable inputs with their time and effort. U.S.A. ISO/TC242 expert speaks to Japanese ISO dedicated magazine "ISOS"
Wiki based Framework for ISO 50001 compliance that provides a paperless EnMS Document Management Operating System, wiki50001. Forming "Energy User Lague of ISO 50001 Self-Declaration, Malaysia" to boost EnMS operation enhancement in Malaysia. 2013, the year of "Continual Energy Performance Improvement"
To broaden association globally in promoting energy performance improvement with ISO 50001 Class EnMS. To disseminate importance of documentation for proper implementation of ISO 50001 Class EnMS operation. We are TEAM's energy services partner in designated contries for M&V enhancement promotion. For free download materials by enms-doc, please click here. "All 12 documents in a set" Economical price on sale making ISO 50001 "self declaration" within reach. Helping companies wanting to explore Japanese market with an objective of susatainablility business development. Open source economic paperless EnMS operating system is very useful to make full use of our EnMS management documents. We are following EnMS and Sustainability progress in Ireland thru SEAI.